Want to win $10,000 cash? 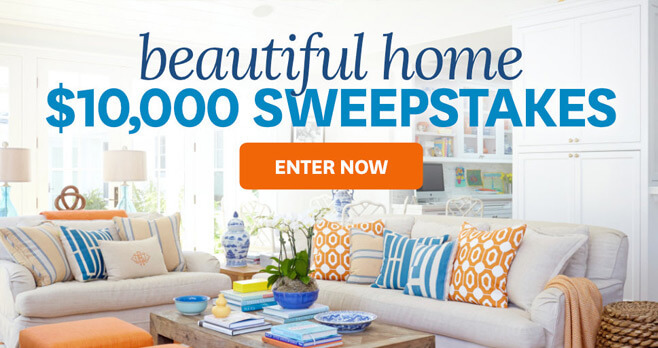 Starting on July 1st, visit BHG.com/10KSummer and participate into the BHG $10,000 Summer Sweepstakes for a chance to win a $10,000 check for a beautiful home makeover, dream vacation, outdoor oasis, shopping spree, or dream honeymoon. It’s your choice! Plus, enter as many times as you want through September 30, 2017 for more chances to win. During the Sweepstakes Period, visit www.bhg.com/10ksummer and follow the instructions provided to submit a completed online entry form to receive one entry. Each entry form submitted will result in one entry into the Grand Prize Drawing. This BHG Sweepstakes is open to legal residents of the 50 United States and the District of Columbia, 21 years of age or older. The Sweepstakes Period begins at 12:01 a.m. CT on 7/1/17 and ends at 11:59 p.m. CT on 9/30/17. On or about 10/9/17, Sponsor will conduct a random drawing from among all eligible entries received and combined from all Websites throughout the Sweepstakes Period to select one potential winner. For the name of the winner, available after 10/31/17, send a separate, self-addressed, stamped envelope to: Winner’s Name $10,000 Sweepstakes, 1716 Locust St., LS 321, Des Moines, IA 50309. For complete details, including Official Rules, visit bhg.com/10ksummer. We just moved and our new place needs alot of work. I need a decent bed to sleep in, my bed is in very bad shape. I also need a sofa to sit on; I don’t have a sofa and I cannot afford one. My condo needs a refresher. In 80 years I have been waiting to win a sweepstakes. I would love a new inside paint job of my condo and to fix up my kitchen cabinets. I would love to make my inside home more lively. I’ve lived in this house since it was built 45 years ago. We have remolded our bathrooms and undated many things in and out of the house but have yet to rehab our kitchen .We are really needing cabinets and a new floor.